Convenient and safe storage of your high-performance cutlery is a problem for many knife owners. Improper storage can cause serious knife damage. 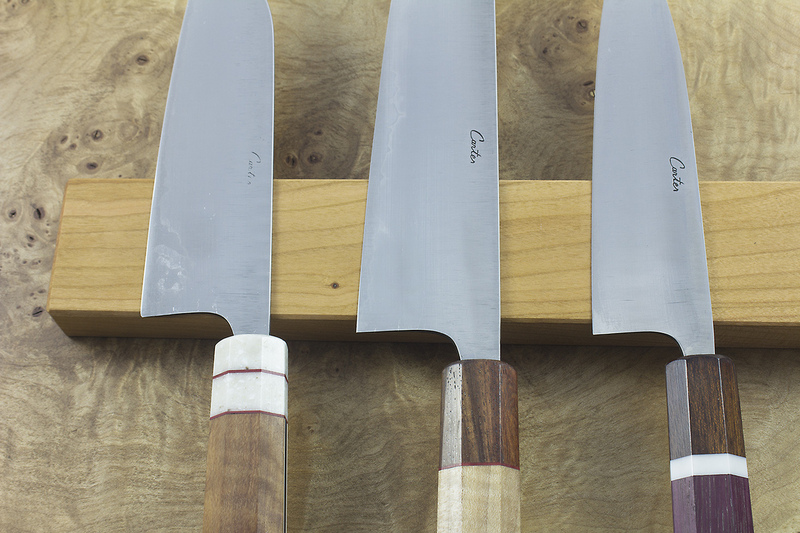 Magnetic metal strips are very convenient to use, but leave your beautiful knives with dings and scratches before you even cut with them! Carter Cutlery is proud to offer our customers the last knife holder they will will ever need. A collaboration project with a custom wood fabricator, these handcrafted knife holders combine rare earth magnets with beautiful, natural woods to create a very elegant solution for knife storage. The powerful magnets firmly hold your knives in place while the wood protects them from being damaged. Carter Cutlery has a very limited supply of these products. Don’t miss out! Which wood is your favorite? Do you like the sizes? As always, we welcome all feedback, please Contact Us. *Each handcrafted magnetic knife holder is held in place using keyholes and requires minor installation (~ 10 minutes). Each knife holder ships with screws and simple installation instructions.